Dark Sky Films have announced that NAILS, the directorial debut of Dennis Bartok will be getting released this November. 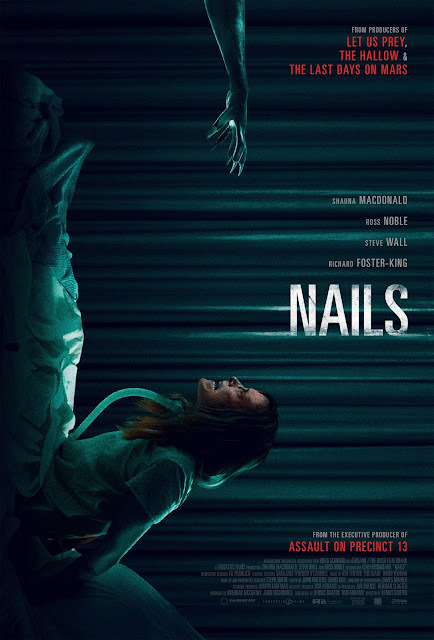 The cast of NAILS includes actor-comedian Ross Noble (Ross Noble: Freewheeling, STITCHES), Leah McNamara (Vikings), Steve Wall (Dominion Creek), director Dennis Bartok and Richard Foster-King (It Never Sleeps). It is from the award-winning production company Fantastic Films (The Hallow, Let Us Prey, Wake Wood) and the executive producer of Assault on Precinct 13. Dana Milgrom (Shauna Macdonald, Filth, Moon Dogs), a track coach and mother who has survived a near-death car accident, only to find herself paralyzed and trapped inside her own body. While struggling to regain control of her life, Dana is confronted with a vindictive spirit; a terrifying presence called Nails, whom she is convinced exists inside her hospital room. NAILS will be released in selected U.S. cinemas and via HD Digital, VOD on 17th November 2017. NAILS will also have a special theatrical premiere at the historic Grauman's Egyptian Theatre in Hollywood on 25th October 2017.